Once again, Ak Lu'um International School, Mexico's first ecological school, is pleased to invite all Riviera Maya athletes and families to participate in the third annual ‘BuyPlaya 5K Run for Ak Lu'um', an exciting 5K race through the streets of Playa del Carmen. Sponsored by BuyPlaya Real Estate Advisors, the leading agency for Playa del Carmen real estate, the race will take place on March 25, 2012 at 7:45 am sharp. 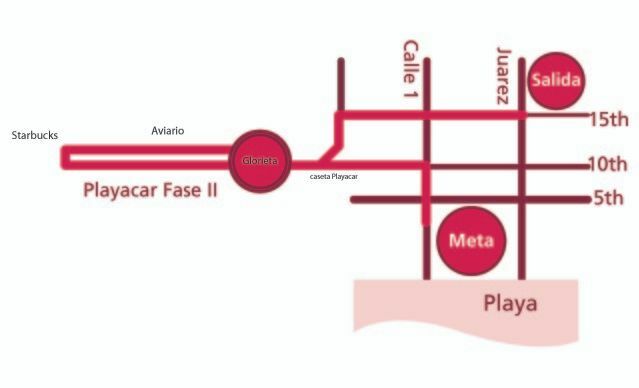 Participants will run, walk or stroll the 5 kilometer course leaving from the Parque Leona Vicario, making the loop through Playacar and finishing in the historical Parque Fundadores. This year, the organizing committee has opened the race to professional level athletes offering special prizes for the 1st place winners in both the Professional Male and Professional Female categories. "We fielded so many inquiries from professional runners and running groups before last year's event that we felt compelled to open the race to this level of competition." Explained race coordinator Gabriela Nuñez, "We hope this will take the event itself to a whole new level and draw even more attention to the school and it's generous supporters. Participants may run, walk or stroll, competing as individuals or as a family. Prizes will be awarded in the following categories: Professional Male, Professional Female, Amateur Male (13 years and up), Amateur Female (13 years and up), Children (6 - 12 years) and Families (3 or more participants). Registration fees are $200 mn per adult participant, $150 mn per child and $100 mn for each individual participating in a family group. Participants may register the day of the race from 6:45 am to 7:30 am. Pre-Registration is strongly recommended and may be done Monday through Friday in the following locations: Ak Lu'um International School, Kaxapa Factory, Hamacarte, Parque la Ceiba and Starbucks. For specific hours of operation for each registration location, visit the official race webpage, http://www.akluum.com/correporakluum. Each runner will receive water during and after the race, fresh fruit and other snacks at the finish and an official ‘Corre Por Ak Lu'um' t-shirt by presenting their tag at the completion of the race. Last year, dozens of local businesses and organizations showed their support for progressive education in Playa del Carmen by sponsoring or making a donation toward this fun family event. This year, Title Sponsor BuyPlaya Real Estate is joined by Terrenos Tulum, Latido de Mexico, Hot Baking Co. and LocoGringo.com as corporate sponsors for the race. Event organizers are currently looking for additional support, media partners and local businesses that would be willing to donate prizes and other essential race items. Please contact Gabriela Nuñez for additional information about the race and sponsorship opportunities. All race proceeds will support daily programs and special activities at Ak Lu'um International School in Playa del Carmen. Ak Lu'um International School is a Waldorf Initiative founded in 2006 in the jungle close to Playa del Carmen. The school's mission is to educate, promote sustainability, develop ecological awareness and encourage children from 2 to 12 to reconnect with our earth. Students at Ak Lu'um learn with their minds, hearts and hands. The curriculum is academically challenging and meaningful with many opportunities for hands-on learning and artistic development. Ak Lu'um welcomes children with special needs and seeks to integrate them fully, giving all children an opportunity to better know, understand and love their fellow human beings. The community at Ak Lu'um International School is bilingual (English-Spanish) and culturally rich with over 10 nationalities represented by staff and pupils.